Just give me some metal to bend and we could end this here! Beware the ides of March, and the films of January, especially if said film comes with the label "from M. Night Shyamalan." No good can come of that, and the proof lies in Glass, Shyamalan's third film in what can only loosely be called a trilogy, one that began with 2000's Unbreakable, and was followed up by the thinly related Split in 2017. Split centered on serial killer Kevin Crumb, (James McAvoy), a damaged man with multiple personalities, or DID (dissociative identity disorder). One of his personalities is known as The Beast, and he's a snarling mass of shirtless, sinewy muscle with super-strength and possible indestructibility. One of those victims was Casey (Anya Taylor-Joy), Split's Final Girl, who returns in Glass, seemingly none the worse for wear after her stay in Kevin's basement a few weeks earlier. We're to believe that since she came from an abusive home, she can recognize the pain that fuels Kevin, and may be be able to save him. So what if he murdered two of her schoolmates! He had an abusive mother! David Dunn (Bruce Willis) has less sympathy for the killer. In the 19 years since his encounter with Elijah Price/Mr. Glass (Samuel L. Jackson), David has lived the life of an undercover superhero, donning his cape rain poncho to fight crime, garnering nicknames that range from "the Tiptoe Man" to "the Overseer." (He prefers the latter.) His hunt for Kevin, who has been nicknamed "the Horde" by the press, results in a wall and window smashing fight in an abandoned warehouse, and eventual capture by the authorities. These "authorities" are actually headed up by Dr. Ellie Staple (Sarah Paulson), a psychiatrist "specializing" in delusions of grander. She's determined to prove that both David and Kevin are not as super as they think they are, and what better way to do that than to lock them up in the same facility Mr. Glass has been sitting in, basically comatose, for almost two decades? She's such a calming presence, with her cream colored sweater dresses, and soft spoken demeanor, that you can almost buy that she merely wants to save these men. (Although, again, one of them is a serial killer, so maybe he doesn't really deserve saving?) But her whole premise, that they didn't really do the superhuman things they think they've done, could so easily be proven wrong--just have David bench press 500 pounds!--that I wouldn't blame you for thinking there might be something else going on. Because of course there is. This is an M. Night Shyamalan movie! To be honest, I never really understood why Shyamalan became such critical darling, even if it was short lived. The Sixth Sense, which is almost universally recognized as his best film, was a solid enough supernatural thriller that it didn't need to rely on its twist ending to save it (which is good, since I saw that twist coming halfway through). And Unbreakable was a serviceable follow-up, with an intriguing concept--superheros are real, and comic books are their coded history--and an ending that wasn't so much a twist as a sucker punch. But following those two films, twists and gotcha endings became Shyamalan's thing, to the detriment of story. If you start to think about the plots of Signs or The Village--at all--they become completely laughable. Badly written dialogue and overwrought performances didn't help, and a string of even worse films became the ultimate plot twist in Shyamalan's career: from critical darling to cinematic pariah. I'll give Unbreakable this: it's succinct. I dare you to watch it now and not be a little surprised at the abrupt appearance of intertitles explaining the resolution. 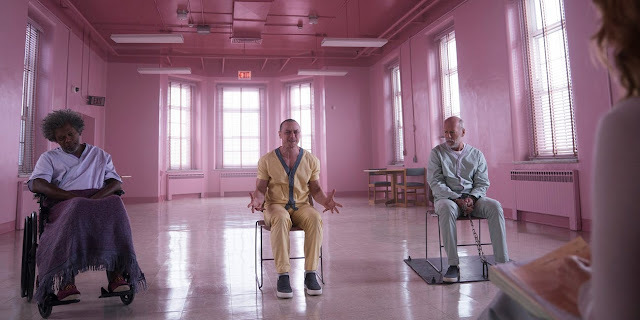 Glass is not so tight, depending on Jackson to spend most of the film's second half on exposition, detailing (again) his theory about comic books and superheros, his ultimate plan, and, in the film's only real bit of comedy, the tropes both comic books and the film we are watching depend on. And both Unbreakable and Glass contain an intriguing concept at their centers: what if there were superhumans and mastermind among us? How would that really play out in real life? But this is a concept that has been tackled more than once in numerous superhero movies that followed Unbreakable, and Glass's take on the subject now feels neither fresh nor subversive.